« Once upon a time and so long ago……..
During A Time of Darkness. It was the year of 1947 in Austria. We were Displaced Persons, (DP) from Yugoslavia with a German name. My father having been threatened by political groups in Croatia, found these threats, on our lives, a reason to flee the country in November 1944. We left with two suitcases and a couple of crates on the last train out of Croatia/Yugoslavia to Vienna, Austria, where we found initial help from my mother’s Viennese classmates. Mother graduated from a “Finishing School” in Vienna a few years before she married. She had kept in touch with her friends and through them we found help. However, the war torn Austria and its very kind people could not keep up with the demands and needs of the thousands of refugees. We ended in refugee camps and were provided with food and shelter through the International Red Cross. CARE packages came to people who were fortunate enough to have had connections with the United States. My father’s cousin lived in Miami, Florida at that time, and who sent us several CARE packages which my parents received with grateful harts. It was during Christmas time that my parents felt the greatest pain of having had to leave their home and family members. And yet, it was times like these that their wish to give their children the best they could that made them unbelievably resourceful. I cannot remember any of the Christmases during these refugee years to ever having been sad. We always had wonderful surprises and exciting moments of happiness. It was December 24th 1947 when late in the afternoon my friend Helga and her brother Peter together with their father came to pick up my brother and me, to go for a hike in the nearby woods. Slowly dusk embraced us, the snow turned deep blue becoming the color of the sky. We were bundled up in high lased shoes, woolen stockings, heavy coats, knitted caps and mittens, having received them from the American Red Cross earlier that week. Still we felt cold and felt our bones and teeth chatter. Helga’s father encouraged us to walk faster to get warm. Our little feet had a hard time to get through the just fallen snow, which reached almost to our knees. Soon we began to warm up while listening to his childhood stories and memories of Christmases long past in Bohemia. Before we knew how it happened it was dark and only the stars and the upcoming moon lit our path. We were on our way home, and arriving at each of our respective doors in the building where we lived, we shook off the snow and felt the glowing warmth on our cheeks and a tingling in our fingertips and toes. and the glories of Christmas Eve. 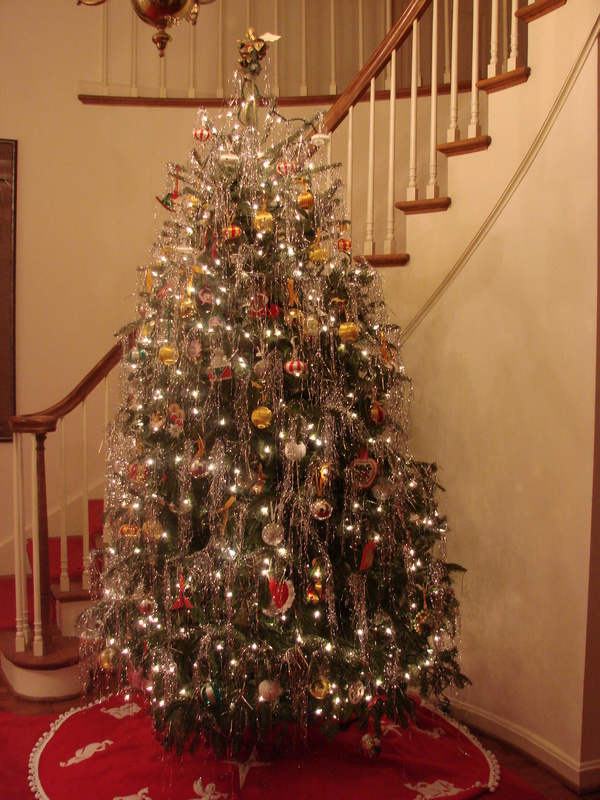 The door opened and there was the most beautiful, sparkling Christmas tree I have ever seen. It reached almost to the ceiling and glittered in silver and light. The light came from real candles and the silver came from hand cut strips of foil (Lametta). My mother had collected fancy chocolate wrappers before the war and had made a big round ball of it, which she took with her in her suitcase when we fled from our home in Croatia. The only other decorations on the tree were a few chocolate candies, which came in a “CARE package from Cousin Eve in Miami, Florida. There were new red mittens for my brother and me and matching new caps, a doll with beautiful blue eyes and eyelashes and real hair, and several little dresses for her, a little pillow and an embroidered pillowcase and a little blanket to cover her…also from Cousin Eve. Christmas was the most wonderful time in my life. After the “Bescherung,” and after we had opened all of our gifts, mother asked us to come to the table for dinner. Mother was a wonderful cook and could prepare a meal with the least ingredients. When we finished we gathered with other refugee friends in the hallways to show off our surprises. We all waited long enough to bundle up again, ather lit some lanterns and we walk to church for the Midnight Mass. Out on the street, seeing all the people with lanterns walking toward the church, and hearing the crunch of every footstep in the stillness of the night made a lifelong impression on me. No one spoke. Everyone was silent and involved with his or her own thoughts. It was the time of night which filled me with the mystery of Christmas and which to this day I still feel. that can be baked several weeks before this very special holiday. Heat the above ingredients in a saucepan, do not boil. Remove from heat and let it steep for 10-15 min. Strain it before adding to the flour mixture. Into a large bowl place the following ingredients. Mix all ingredients in the bowl and add the butter/honey mixture. Transfer the dough into a smaller bowl and cool in refrigerator for about 2 hrs. dough – much like play-dough. Roll it out to be about 1/4 inch in thickness and then cut out any shapes you like. Bake at 375 F for about 10 min. or until the gingerbread is lightly browned. Use an electric mixer or electric hand mixer. Take a 1lb box confectioner sugar and add 2 egg whites from size large eggs. Mix till it becomes a fluffy paste. The paste should be like a thick marshmallow cream. Use a disposable pastry bag with a Wilton Star Tip #18. Or……..use a plastic freezer bag cutting the tip off of one of the corners. Be careful not to cut too big of a hole, it has to be very small. brought back to room temp. and the jolliest Holiday ever! At this wonderful season your heart-warming post is so uplifting! Many thanks for your friendship. I hope you and your family have a great holiday season. What an amazing story and wonderful memory to hold. Happy Christmas to you Maja and your loved ones too. You reduced me to tears on this one. So touching and real and wonderfully generous of you to share this with all of us. You truly have lived a life worth sharing and I am grateful to God that you all had the wisdom to make the most o…f your circumstances. You have taken those memories and replicated them in your words for us to receive and understand that life if not about the stuff so much as it is about the love and kindness of strangers. Lovely story about a very difficult time in history…..a pearl. Your taking it out and showing it has given it a luster……….thank you. Merriest of Christmas’s to you and your family. Thank you – Linda, and your kind words have gathered tears in my eyes as well. As we spent the seven years in refugee camps – I really never felt sad – my parents made us face reality and my brother and I had a happy childhood because of it. I had friends with whom I laughed and danced and played, I never knew that life could be any different……I was young enough that nothing mattered as long as my mother and father were with us…. Thank you for this Maria. Even though you were a refugee, you had strong family and friends who gathered to share something that many people never experience. You made it sound like a Christmas many dream of. I’d like to share this if it’s ok with you. Donna…….Of course you can share it with anyone you like……..it would please me if you would………thank you!!! Maria, a beautifully told story reminding us all of the true meaning of Christmas. Loved it! Thank you Maria- that was so touching. About 10 years ago Courtney my youngest interviewed your mom for a project at school about her time in the “Old Country” I forwarded this story to Courtney as well, I am sure it will remind her of Oma! Debbie………..thank you so much for reminding me of Courtney and Oma………I remember my mother telling me about it……. Thank you for sending it on to Courtney……please, tell her hi from me………. Maria, Your story is a very precious gift to all of us at this Christmas Season and all through the years! It touches the soul deeply! I can’t thank you enough for sharing this part of your life with all of us FB friends. I’m also looking forward to making your special cookie recipe! I’ll let you know how they turn out! Merry Christmas to you and all your family! I have no doubt it will be filled with much love and joy, for sure! Thanks for a beautiful story, Maria. Remembrances like that are real Christmas Treasures. Maria, thank you for sharing your beautiful memories with me. Merry Christmas. Thanks so much for sharing your beautiful story. We all are so blessed in so many ways. I am blessed to have you as a FB friend and to have you and Bonnie in my life…… The Springer girls sure are a daily blessing in my life!! Merry Christmas !! God bless!! Such a moving and beautiful story, Maria. What a wonderful way to start the day! I want to share this as well with my family and PATHWAYS students. I can imagine them trying to picture the Christmas that is most precious to you and yet, sadly, so far from what many of us experience …in our own lives. I feel so blessed that God has given you the ability to remember your childhood in so much detail. Your friends are truly grateful for your beautiful gift of sweet memories. Beautiful, Maria! Thank you for sharing your warmth and love…Merry Christmas! You have such moving memories and write them so well. This is such a heartwarming story, Maria! A beautiful story, and a reminder in these fast paced times about what really matters. Thank you for this! That was such a beautiful and moving story, Maria. It is really a great example of the true meaning of Christmas. It contains such meaning and lessons to learn. Your story was straight from the heart and I am deeply moved by it. Thank you for sharing this story. I wish you and your family a very Merry Christmas! Peace, Joy, Love and Happiness! What a beautiful and meaning ful story. If that’s not the “true” meaning of Christmas, I don’t know what is! Thank you all for your heartfelt comments. I love hearing from like minded friends……..it takes very little to be happy, one only needs to look for it…………. You are so lucky to have learnt from a very young age how to appreciate the most simply things in life. And love guided you and yours through these hard times just like the bright light of Christmas…Thank you for sharing Maria. Happy Holi…days to all of you! Hi Maria; Yes I will pass on your hello to Courtney- I am sure this will bring a fond memory to her as well. Merry Christmas! Maria, thank you for sharing such lovely times from years past. Your experiences are interesting from your time spent sooooo far away. May you and your family have a very Merry Christmas and a new year filled with good health and happiness. Maria, you have a way of writing with such vivid description that I feel like I am right there with you. Thank you for sharing all of these memories with us. Merry Christmas from sunny Florida ! We enjoy your posts from Maja’s Kitchen so much. The recent post on Christmas in Austria was wonderful.